I was treated to the (personal) discovery of the We Feel Fine project that has been online for two years scanning the blogisphere for posts with the word "fine". This tool not only aggregates blogs but exposes stories within them. It is a discovery engine that can be used to catch feelings and the stories behind them. Jonathan Harris, one of the designers of We Feel Fine spoke at Pop!Tech today and talked about finding stories. This idea of discovering stories in different ways interests me and it was his demonstration how technology can be used to expose stories within stories that really excited me. To learn more about Jonathan Harris and his stories, check out his TED Talk. (Note: his Pop!Tech talk hopefully will be available soon too. Watch for the pop!cast. It is especially interesting to view Jonathan Harris in view of an earlier presentation by Daniel Pink. Frequent readers will know that I really embrace the ideas expressed by Pink in A Whole New Mind, especially the idea that we need to celebrate both the right and left side brain activities. 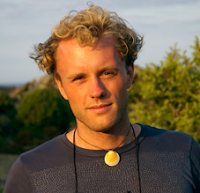 Jonathan Harris exemplifies this new professional, blending elements of computer science, anthropology, visual art and storytelling. His creative/innovative ideas of visualizing information and extracting meaning/stories from the information make him a hero. and tagged as conferences, digital storytelling, tools. Currently, there are no comments. A network of remarkable people, extraordinary conferences, powerful ideas & innovative projects that are changing the world. If you love TED, then check out the POP!Tech conference in Camden, Maine and online. I am especially interested in listening in on the Thursday session titled "A WHOLE NEW MIND" featuring among others Daniel Pink whose book of the same title confirmed many of my values regarding education, the importance of creativity, collaboration and story. Find some time Oct 17 through 20 to watch and participate in this promising conference. and tagged as announcements, collaboration, conferences, creativity. Currently, there are no comments.